Ever had the feeling, on first meeting someone, that they seemed curiously familiar to you – that you had possibly known them before, some time, some place? This sense of ‘déjà vu’ – the phenomenon of having ‘already seen’ a situation or a person – is experienced by many of us when we encounter individuals who are to play a major role in our life. Science can’t really explain it – so what’s it all about? More often than not, a ‘been here before’ reaction is nothing more than a subconscious memory of an earlier occurrence in our life. But what if there’s no obvious connection with anything or anybody in the here and now? In such cases we might well joke that we must have met the person in question in a previous incarnation. A throw-away comment – yet could there be rather more in it than we might suspect! If you happen to believe in reincarnation, then you’re certainly not alone. It’s estimated that nearly two thirds of the world’s population hold the belief that we experience many lives on earth in different physical bodies, constantly renewing our acquaintance with each other and ironing out our interpersonal difficulties. In this sense, there’s probably no such thing as a ‘new’ relationship – nor one that doesn’t come with some kind of carried-over agenda. The universal law of karma – or cause and effect – dictates that we meet repeatedly with the same souls, lifetime after lifetime, to develop our understanding and expression of love. ‘What goes around, comes around’, it’s often said – and whatever we’ve created in the past, we apparently have to face up to and deal with now or in the future. When there’s unfinished business in a relationship, it seems there’s no escaping until we’ve finally resolved it. But how do we know when a relationship is karmic – and what can we do about it? Discover the hidden karmic secrets of your relationship! 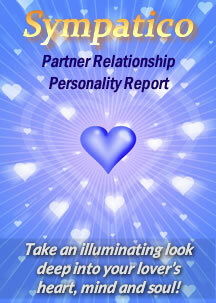 Get your 'Starlight & Shadows' Relationship Strengths & Challenges Report Now! 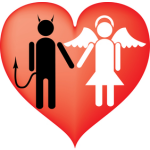 When is a Relationship Karmic? If you feel an unusually strong reaction towards a new acquaintance for no apparent reason, it’s possible that you have indeed experienced a previous incarnation together. If you’re compulsively attracted to someone, maybe against your better judgement, or are driven by a force you don’t understand and have no control over, then this could well be a karmic relationship. It’s these ‘fatal attractions’ – the ones where fate seems to have had a hand in bringing us together, where we’re ‘fated’ to go through a lot of pain, and where fate, not us, appears to control the outcome – that we tend to learn the most from. Spiritual teachings tell us that negative, rather than positive, emotions create the strongest karmic attachments, and it’s the challenging relationships we need to work hardest on in order to set ourselves free. The smooth running relationships where everything goes like a dream – the ones with nothing much to stretch us or test us and with few difficulties to overcome – aren’t generally considered to be the best ones in terms of our personal and spiritual growth! Nor are they, from many people’s point of view, necessarily the most interesting, the most fun, or the most fulfilling. Frequently we sense – maybe quite rightly – that if a relationship is too easy, it might turn out to be boring. Most of us need at least a little bit of a challenge in a relationship to give it some purpose and meaning and to keep us hanging in there. For this reason, when you look at the astrological compatibility ratings for people in long-term partnerships, they don’t always reflect the highest values. Astrologically, it’s the ‘hard’ contacts between two individuals’ birth charts that give some bite to their relationship and keep the excitement alive. At the same time, of course, it’s these tough cross-aspects that tend to lower their compatibility scores. When the love dynamics between two people are too soft and undemanding – as is sometimes the case when their compatibility ratings are extremely high – although things can seem fairly idyllic at first, over time they may lose their lustre. Human nature being what it is, without something to ‘get their teeth into’ in a relationship, people often start to look for it elsewhere. What Does the Future Hold for the Two of You as a Couple? 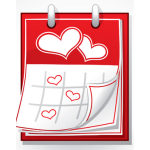 Find out in your 'Relationship Oracle' 1 Year Relationship Forecast Report! When we instinctively sense that a relationship is karmic in origin – and that we have ‘stuff’ to work out with a certain individual – a detailed chart comparison can throw light on the specific problems that will need to be confronted. It is here that astrology can prove useful, helping us to understand what we’re up against, giving us a sense of purpose, and offering possible solutions to karmic issues. In this respect, what it tells us about the potential challenges in a relationship is just as valuable as getting to know about all the good things! Saturn is the planet traditionally associated with karma in astrology – probably because it tends to show where we have to work hardest in life, often experience some sense of duty or obligation, and may feel a need to put things right. In reality though, all the planets – especially the outer ones – have their own particular karmic meaning and importance. Each has a positive and a negative polarity and, in a chart comparison, each can be expressed in a karmically helpful or unhelpful way. What are the most common kinds of karmic challenges indicated in a birth chart comparison? Well, obviously control dramas - highlighted by a challenging alignment of the planet Pluto in a chart comparison – where one or both people seek to wield the power in the relationship at the expense of the other’s wellbeing. Equally, issues centering around deception, betrayal and martyrdom, symbolized by tough Neptune cross-aspects between two charts. These, together with difficulties caused by rejection and inconstancy (symbolized by Saturn and Uranus respectively) are the big challenges that can occur over and over in our relationships, frequently continuing throughout our life until we learn to channel the relevant energies in a more harmonious way. Are you repeatedly drawn to the same kind of lovers who make you unhappy or are bad for you in a particular way? If most of your relationships tend to follow a similarly destructive pattern, then the chances are that they all possess a common karmic theme. The ever turning wheel of karma may well be the last thing on your mind when you’re looking for a partner or a date – but don’t dismiss it too lightly. The choices we make when we embark on a love affair – however brief – might just have some far-reaching effects! Which Star Signs Tend to Be the Most Faithful? And Which Ones Are Most Likely to Cheat? In for the kill or More Passive-Aggressive? Your Mars Sign Offers Some Eye-Opening Insights into Your Fighting Style! Fatal Attractions - When Love Is Too Much of a Good Thing! Which Star Signs Tend to Be The Most Honest - And Which Ones Are Likely to Be The Biggest Fakes?